“I would love to have afternoon tea with the great Charles Dickens. I would like to see him in the flesh and hear the sound of his voice, and I could find out what it was like to live in the 1800’s. I think he would be so witty and amusing and possibly a good mimic. We could discuss two of his books, Tale of Two Cities and Hard Times (that I studied for my degree in English Literature) and he could give me some insight into his lively characters. It would be intriguing to find out why his writing was so prolific, and I could try and get some tips from him on how to write my first novel and how to pick a good title – this would be a tea of the century”! 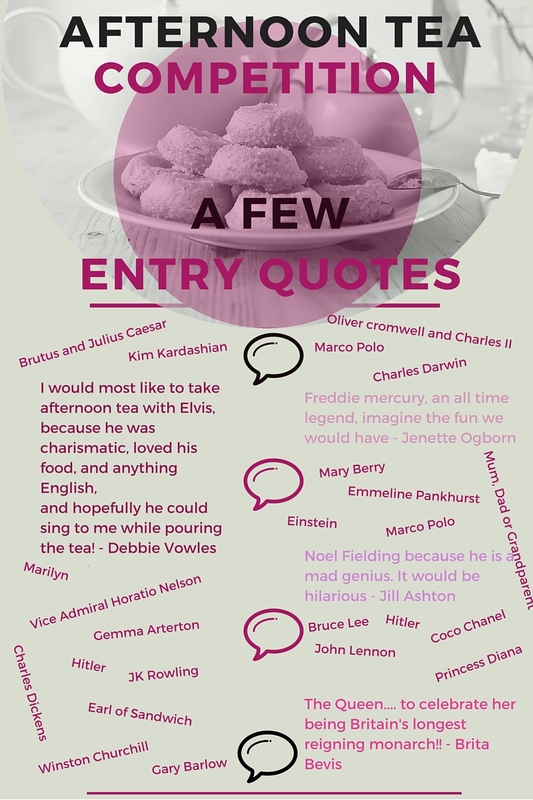 We really enjoyed reading your entries as to who you’d like to take to afternoon tea and wanted to share some of the results. We have hundreds of afternoon teas to choose from – which one is your favourite?